The Association to Advance Collegiate Schools of Business (AACSB) has named Anil Rai Gupta (MBA ’92, LLD ’17) as one of its 2019 Influential Leaders. In its fourth year, the 2019 Influential Leaders challenge recognizes 33 alumni—and the business schools that prepared them—who personify the role as a visionary figure or change agent. Gupta, who is chairman and managing director of Havells India Limited, has spent a quarter of a century transforming the company his father started in 1958 to a globally recognized electrical and consumer durable goods company. He credits the School of Business for preparing him for the challenge. 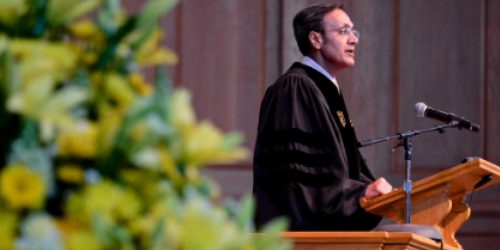 Gupta returned to Wake Forest to offer the 2017 Graduate Hooding Ceremony keynote in Wait Chapel, 25 years after receiving his MBA degree from Wake Forest University School of Business. He told the audience how the personal relationships between students and faculty taught him how open communication is essential for learning and relating to people – something that is critical for all businesses. The next day, he received an honorary Doctor of Laws degree from Wake Forest University. The Wake Forest University motto of “Pro Humanitate” (“for the good of humanity”) has taken root in Gupta and flourished at Havells. Gupta started Havells’ midday meal program through the organization’s QRG Foundation more than 10 years ago. Now, more than 60,000 schoolchildren in India receive safe and nutritious lunches in more than 693 schools each day. Collectively, the class of 2019 represents a variety of industries, countries, and backgrounds—yet each shares a passion and dedication to lead or innovate within their industries, impact their communities, and inspire future business leaders. The group represents 33 AACSB-accredited schools in 13 countries.